'Red October' was a gift from a friend spring 2007. It had a rough beginning when the soil in one of my older gardens proved to be too heavy; so I ended up putting it in a clay pot for a year to dry out. Amended the garden with lots of sand and compost and it's doing well now. This picture from July 15. Here is my oldest - bought in 2009. You're a couple of weeks ahead of us. I took a look at mine this morning and it has large buds but no flowers yet. 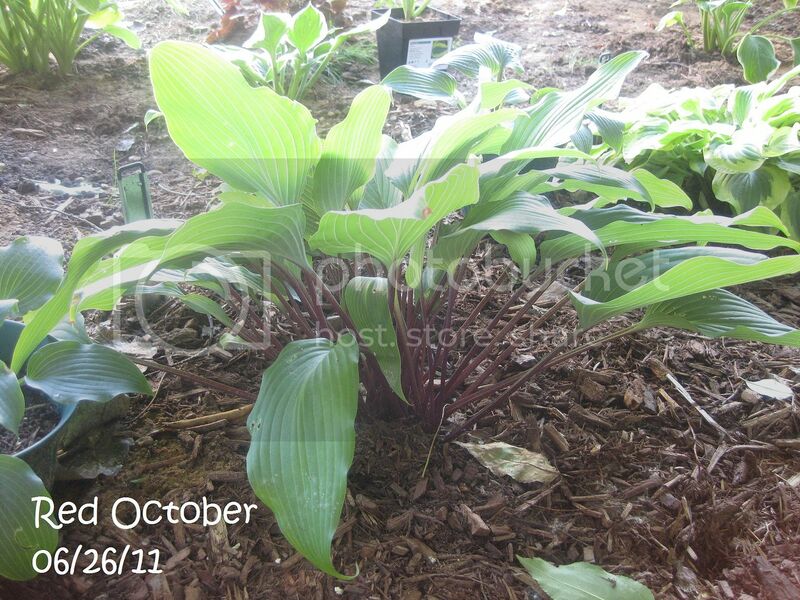 Red October was my first red stemmed hosta. Second year in my garden. I got this one from Chris! I love the color of the leaves during the early summer. I planted a red begonia next to it so I could tell it apart from One Man's Treasure (without looking at the tags) that's down the hill. So, can you identify what the big differences are between RO and OMT? I love the first pic showing its red legs. LOL, no can't tell them apart yet, hence the red begonia I think Red October's leaves will be longer (and have white backs). I think OMT has darker petioles. I have not put them side-by-side but OMT caught my eye one time by looking like the petiole was a solid black color. Last edited by redcrx on Sep 10, 2011 7:16 pm, edited 1 time in total. Took some shots of the leaves and petioles with some others thrown in for comparison. All are labeled from left to right. Interesting leaf comparisons above. Has anyone used RO as a breeder? Mine has grown so much that I need to divide it - running out of space. And it's beautiful at the moment as it's blooming. Haven't yet edited the pics I took but I may add them later. Last edited by ViolaAnn on Dec 01, 2012 8:28 am, edited 1 time in total. And it has branching scapes - 3 that I can see. O thanks. I KNEW there was something else I was supposed to do with that picture. But yes, Definitely branching scapes. Maybe I should go look at the rest of my late bloomers when it stops raining. (Hush! I should not complain. We desperately need rain). And I think the one coming out to the right may have two branches. I think branching is a matter of maturity or size since my small ones do not have any branches. 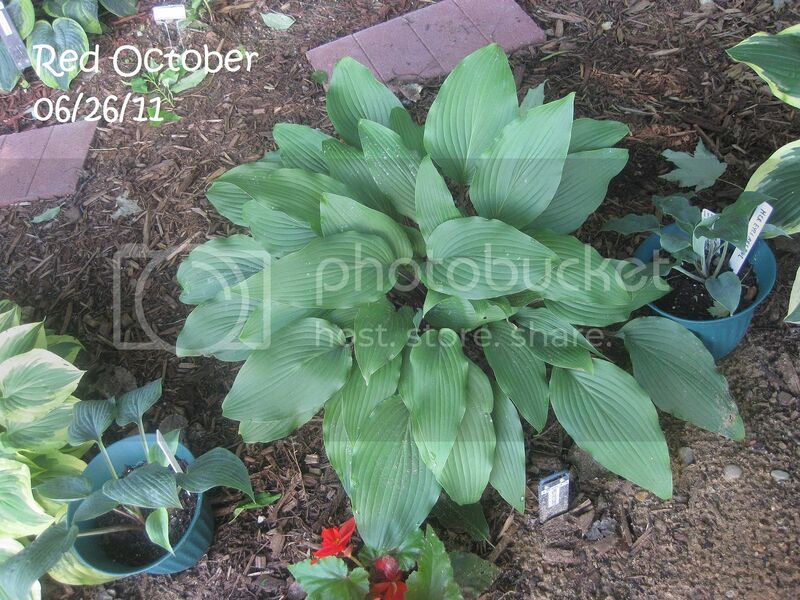 2014 - it's gotten to be quite a large plant. May need to take some divisions from it soon. It's starting to bud and will probably be covered with bloom in late September. Picture July 16, 2014. I have it located next to 'Fire Island'. Here are the two of them early in the season. Photo May 18. 2015 - June 21. Growing well. As I write on Oct. 1, it is in full bloom but also has many slug holes. I went out this morning and noticed one of my Red October was looking weird. It turns out it is putting up one of those odd leafy scapes so it will flower way out of season. I have seen these rare things occur at random over the years but what's really unusual about this one is that about 8 feet away a Miss Ruby did the same thing this season (I posted those photos also.) Wondering if the odd Spring may have triggered something - where March is warm and gets things going only to have winter return in April and then 4 weeks of clouds and rain - confused everything. Both the Red October and Miss Ruby went into this garden last season - both out of pots I have had for a while. Gives you a nice opportunity for hybridizing. It's hard to get seeds to ripen on Red October as it blooms so late in the season. I had that happen to my 'Allan P. McConnell' border this year. The flower scape was up0 before the rest of the plant emerged. But as David said, it gives you a good opportunity to possibly get seeds from it.